Around the same time, the Fall of Potential (FOP) method was widely used to measure a grounding system’s resistance to earth. Although it is most applicable for the small, easy-to-isolate grounding systems that were common half a century ago, it’s still widely used today. Since the mid-twentieth century, the physical world around us has changed dramatically. Even in rural areas, it’s nearly impossible to find yourself standing in a spot that isn’t electrically influenced by something in the area. FOP requires the site under test to be isolated, but neighboring infrastructure like overhead wires, underground pipes, gas lines, cables, train tracks, grounding systems at surrounding facilities, etc. can all affect the grounding system being tested and produce results that can’t be trusted. A reliable FOP test is simply not feasible in the densely built environment we find ourselves today. 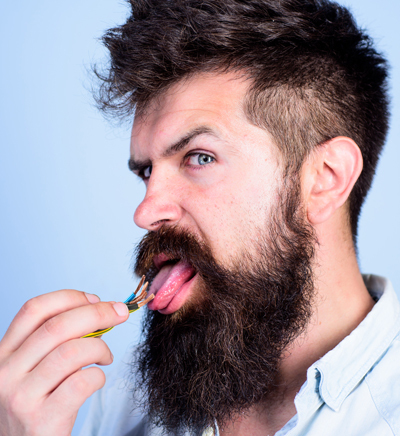 Fortunately, the “touching” approach to voltage testing has evolved to safer and more effective methods. But despite its known limitations, FOP remains the most common method of measuring a grounding system. That’s why, in 2012, IEEE updated Std 81™, which addresses grounding system testing. The FOP test is performed using portable, battery-powered (but not wireless) equipment that is relatively easy to set up and use (even improperly). 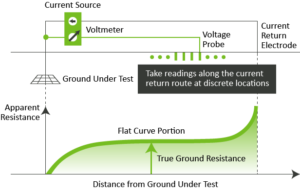 The FOP method attempts to measure grounding system resistance by injecting current into the grounding system, which then flows through earth, returning back to the test set via an earth-embedded current return electrode. The voltage that this test current causes is then measured by an earth-embedded voltage probe. The voltage starts out relatively small when the probe is located close to the grounding system under test and increases as the probe is moved away from the grounding system. At some distance from the grounding system, voltage begins to level out and remains fairly constant before it increases again as the voltage probe is moved closer to the current return electrode. The test provides a reading of apparent resistance by dividing the voltage by the injected current (Ohm’s Law). On small, isolated grounding systems, a properly configured FOP test can produce accurate results. At larger sites, setting up an FOP test is much more complex, and it’s even harder to know if you are truly isolated. For it to work correctly, the current return electrode must be placed at a distance from the system under test that is at least five times the diagonal dimension of that system. Otherwise, it may not be outside of the sphere of influence of the grounding system under test, which can lead to inaccurate results. On large sites, this can literally be a mile or more away (so make sure you bring a really big spool of wire). FOP testing is generally not suitable for measuring large grounding systems. It should never be performed on energized or interconnected systems, since FOP requires the site under test to be isolated from all interconnecting grounding systems, including utility feeds, incoming communications cables, and underground pipes. Additionally, nearby infrastructure such as overhead wires, train tracks, grounding systems at neighboring facilities, etc. can all adversely affect the test and produce results that can’t be trusted. The SGM test system is just that system. It’s a computer-based test method developed by Sakis Meliopoulos, Ph.D., professor at the Georgia Institute of Technology, under a grant from the Electric Power Research Institute (EPRI). The SGM can test all aspects of an existing grounding system, including resistance and impedance, without having to de-energize or isolate it. The SGM is a combined variable-frequency current source and a seven-channel data acquisition platform. Its software allows the operator to select the function or test to be performed, change test parameters, and define the geometry of the system under test. It also allows the operator to identify the positions of the current return electrode and six voltage probes via their GPS coordinates relative to the grounding system. The seven-channel platforms (one for the injected current and six for individual voltage measurements) allows more data to be collected during current injection and improves test accuracy and allows for the statistical analysis of the data. While the SGM follows the basic principles of FOP, it also emphasizes the simultaneous potential differences between the six voltage probes and their unique voltage profile relative to the grounding system. 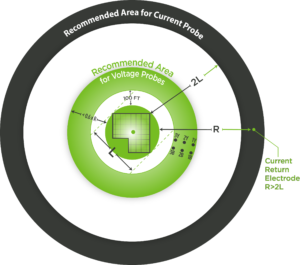 By concentrating on voltage differences, the current return electrode doesn’t need to be placed as far away as it does using FOP; it only requires a distance of two times the grounding system diagonal, which significantly reduces testing time. Using the SGM software, the operator models the grounding system (or imports a model) incorporating appropriate grounding system attributes such as conductor type, size, depth, and number of interconnected ground rods. She also designates the positions of the current return electrode and six voltage probes in the model and relative to the grounding system. Then the software performs a series of voltage lead calibration checks, gathering data pertaining to the capacitance and inductance of the leads and the voltage probe-to-earth resistance. These results are displayed prior to the current injection tests so the operator can correct probe issues, if any. Other test methods, which don’t provide this information, leave the operator to assume that there are no issues that would adversely affect the quality and accuracy of the test data, even when there may be. The software filters out electronic noise, compensates for errors, and reports on the coherence and quality of the measured data. It also compares measured voltage gradients to the modeled and calculated voltage gradients. Modeled gradients are based on “perfect world” conditions where the soil resistivity is homogeneous, the ground conductors are perfect conductors with no resistance, and there is zero interference or noise. In the real world, however, soil resistance is never homogeneous, ground conductors are imperfect conductors, and contiguous infrastructure impacts test results. The software then presents the operator with the impedance and phase angle for the system under test along with a statistical analysis that estimates measurement error or confidence level in these measurement data. For years, when we see people either setting up an FOP test (or having already performed one), it’s wrong at least 90% of the time. Either the system is energized and not isolated, or the probes are nowhere near far enough away to deliver accurate results. This begs the question: Why on earth would anyone specify or conduct FOP testing when results are all but guaranteed to be questionable at best? Contact us for more information on grounding system design and assessments. This product incorporates technology developed for the Electric Power Industry under the sponsorship of EPRI, the Electric Power Research Institute.